Kelty and Osprey are two of the leading manufacturers of durable hiking bags. They also have several bags that are direct competitors due to their similarities, such as the Kelty Redwing 44 and the Osprey Farpoint 40. When shopping for a new hiking backpack, consider the pros and cons of these two reliable packs. The Kelty Redwing 44 weighs about 2.7 pounds and has a capacity of 44 liters. It also has a removable hip belt, allowing you to convert the hiking backpack into a daypack. Most hiking backpacks are constructed from nylon, which is a durable, flexible material. The Kelty is made with polyester, which is also durable but not as breathable as the nylon. One benefit of the Kelty Redwing 44 is the dual-sided loading pocket. The pocket located on the top of the pack allows you to load gear from the top or sides. This is a little more convenient than a standard opening. Other highlights include attachment points, a hydration sleeve, and side water bottle pockets. The hydration sleeve is padded and located in the back of the primary compartment. This also doubles as a laptop sleeve. The attachment points located on the front pocket allow you to attach extra gear to your bag. There are also a couple attachment points on both sides of the backpack for attaching trekking poles. The Osprey Farpoint 40 weighs just under three pounds, making it just slightly heavier than the Redwing. However, the weight is close enough that you should not notice any difference. The storage capacity of the Farpoint is 40 liters. The Farpoint 40 is constructed of nylon and the stitching is secure, resulting in a backpack that is more durable than the Redwing 44. The Farpoint is also backed with a lifetime warranty. As with most hiking backpacks, the Farpoint 40 includes a back panel to provide more comfort when securing the backpack to your body. However, you also have the option to remove the back panel. This creates a slimmer profile and slightly reduces the weight of the backpack. If comfort is a concern, you should also enjoy the compression straps found on the Farpoint 40. These straps include extra padding for additional stability and support. While these backpacks are made by different companies, they do possess several similar features. They both are designed for hiking and travel. The Redwing 44 is slightly larger but both bags are still suitable for carry-on luggage on an airplane. Both bags also include attachment points for connecting extra gear. The Redwing 44 features several attachment points on the sides and front pocket while the Farpoint 40 uses a daisy chain for attaching more gear. Another similarity is the inclusion of extra pockets for organizing your items or storing water bottles. As expected, you get plenty of options for storing your items and dividing gear into different pockets or compartments. The Redwing 44 and Farpoint 40 have many differences that should make it easier to choose between these two options. The Redwing 44 offers more storage. Instead of 40 liters, you can store up to 44 liters of gear. The Kelty Redwing 44 also includes a hydration sleeve that you can use as a laptop sleeve.The Farpoint 40 sets itself apart, thanks to its durability and the lifetime warranty. The Farpoint is designed to take abuse and should hold up with repeated use. If you experience any issues with the bag, including wear and tear, you can get a replacement with the lifetime warranty. Some people may also find the Farpoint 40 to be the more comfortable and secure option. It includes a removable back panel and compression straps with added padding. 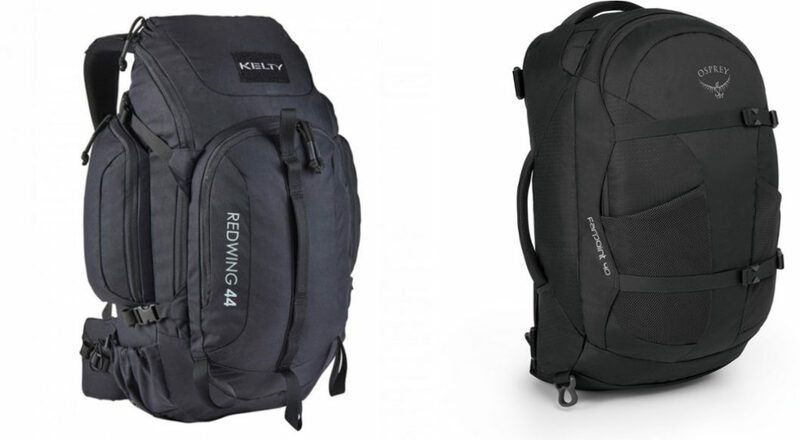 Redwing 44 vs Farpoint 40: Which Pack Should You Choose? The Redwing 44 is often the cheaper of the two backpacks. It also provides a little more storage and includes a sleeve that can hold a laptop. The Farpoint 40 may cost slightly more. However, it is more durable.You cannot go wrong with either option. In the end, your decision may depend on your size requirements. If 40 liters is enough for your storage needs, you may prefer the Osprey Farpoint 40. If you need more room, consider getting the Redwing 44.